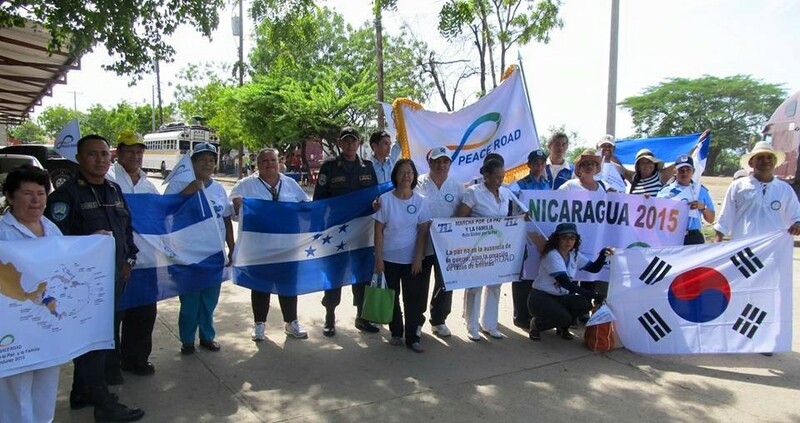 FFWPU Nicaragua: On June 13 to 16, Nicaragua became the third Central American nation to hold the Peace Road Tour. 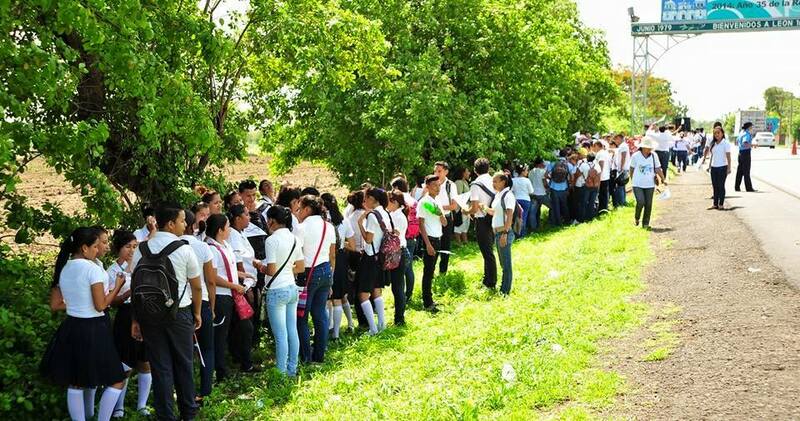 The delegation of Nicaragua and other youth connected with our organization–about 18 people–went to the border with Costa Rica to receive the Peace Road flag from Costa Rican delegation. Despite difficulties from the border authorities, we received the flag with great joy and shouted Mansei. On the following day a group of 12 cyclists left from Managua and rode about 90 Km to the city of Leon. Three kilometers before reaching the destination, a group of about 340 people waited and followed the cyclists and marched with them to the Victory Sports field. After a short message given by the National Leader, Rev. Jorge de Oliveira, a few shouts of peace slogans were made and the activity concluded by serving light refreshments to everyone. 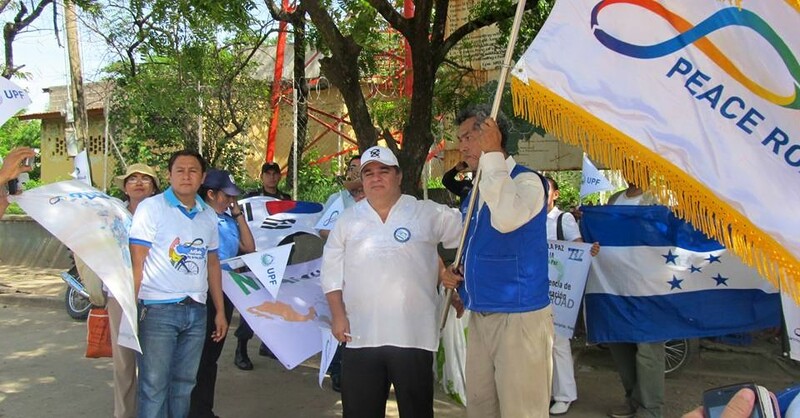 The main organizers and the main participants, besides the Unificationist Leaders of the city of Leon, Gerónimo Vargas and Marcia Jirón, and distinguished Peace Ambassadors, and leaders of the National Police were present such as: Luis Fernando Barrarte Jiménez, the Commissioner of Departmental Director, Denis Fonseca Bárcenas, the Second in Command, Captain Mario Ruiz, Responsible for the Youth Department, Alberto López, Pschycologist of the Virtual School of the Police, The children of the Buffalo Infant Baseball League of the city of Leon. Dr. Ana Rosa Fonseca Bárcenas, ex sub-director and legal adviser of the Immigration department Dr. Muirel Gamez, Other participants were 5th-year students of the National Institute of the West. 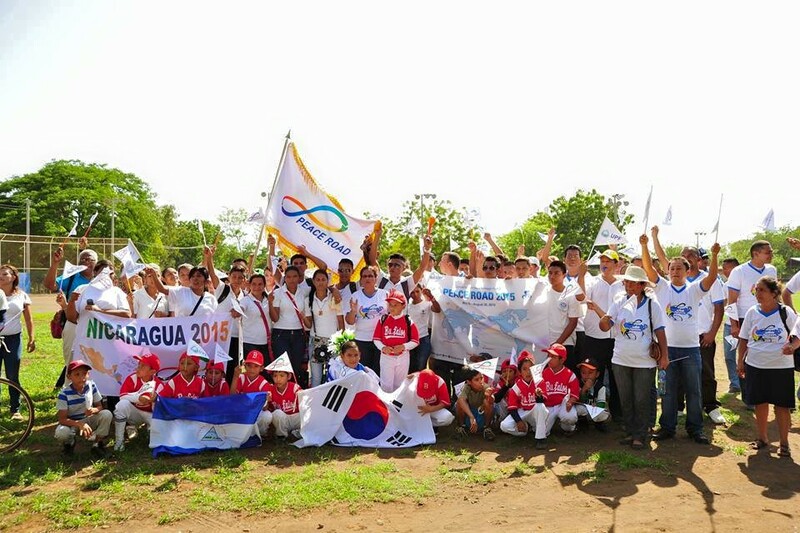 Various members travelled to Leon to participate in the activity. We had the support of the police who came to give assistance with the traffic on the road. In the morning of the following day, June 16, we left on our way to the frontier of Honduras with a delegation of 27 people. We met with delegation of Hondurans in the frontier town of Guasaule. It was a very emotional encounter. There was a powerful spiritual atmosphere there. 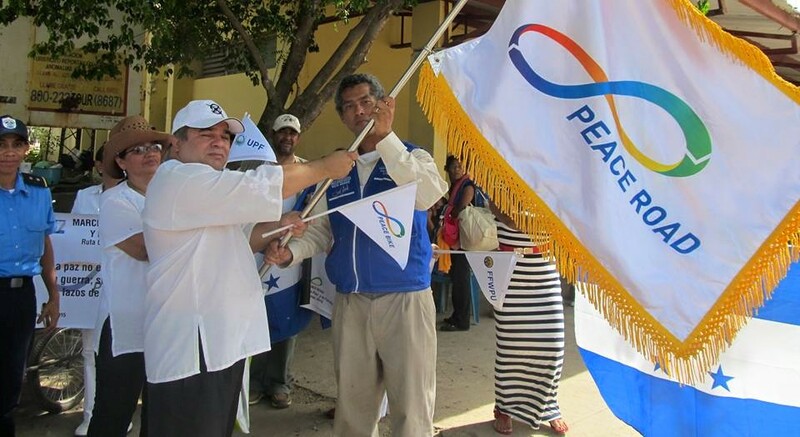 We cried and embraced each other while delivering the Peace Road Flag to the delegation of Hondurans. In that moment, we could feel the presence of God and the True Parents with us.